SNES The Mask (USA) in 10:09.5 by slash_star_dash. Based loosely on the plotline of the movie by the same name. This game is about a man named Stanley Ippkiss, who finds a powerful mask. However evil has also become aware of this mask and steals his girlfriend (as in kidnapped, not with a pickup line) in order to obtain The Mask. 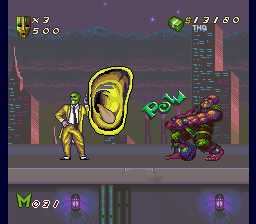 One of the traits The Mask seems to give Stanley is extreme speed, so naturally, aside from a couple boss fights, the game play is extremely fast throughout the movie.